THE EASY WAY TO IMPROVE YOUR POSTURE! 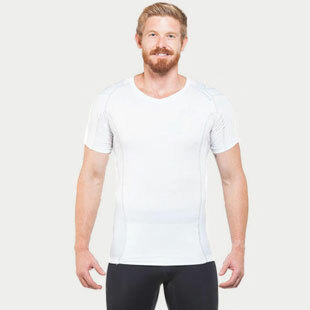 The Alignmed Posture Shirt(R) will help mold your body into superb posture! Alignmed's proprietary Touch Tension(TM) Technology uses controlled resistance called NeuroBands(TM) to activate specific muscle groups to keep the body upright. Constructed with anatomic support and tension panels to encourage muscles to fire and joints to align. Perfect for improving posture and reducing pain.